First, we share our response to this very special statue and the blessing. This figure of a homeless man as Christ sleeping on a bench is, sadly, highly realistic art. We have witnessed it for years,and we have reached out in response. But structural change is needed and changes in the minds and hearts of people will help make this happen.We have served the homeless in New York City, Hartford, CT and Fort Myers, Florida since 1982. Sadly the man(or woman or youth) is STILL on the bench there and across the relatively “affluent” USA. In our work in Guyana, South America and in Medellin, Colombia, South America people lying in the streets wrapped in plastic against the elements abound. Perhaps as our Pope of the poor, Francis, draws attention to this immoral phenomena of homeless people living and dying in our streets actions to change this in all places will spring forth. That is our prayer. Our Good Shepherd Ministry has served the homeless in Fort Myers, Florida since 2003 when we bought a home for a homeless family. In 2007 we started feeding the homeless and hungry in Lion’s Park with the Lamb of God Lutheran Episcopal Church ,continuing it on our own until 2009 when we bought another house for a church and transitional living facility for homeless people. We continue in this hard work and have many good volunteers to help us. But, structurally, things are bad for the homeless in SW Florida and everywhere, and they and do not easily change. May this statue of Christ as a homeless man and the Pope’s blessing help inspire change to happen so no one has to live on the streets. All blessings to the artist, Tim Schmalz. A St. Jacobs-based sculptor’s statue depicting a homeless Jesus has found a new home in the Vatican. Priya Mann has the story. It was a statue that couldn’t find a home: a life-sized sculpture of Jesus depicted as a homeless man sleeping on a park bench, wrapped in a blanket, with his crucifixion wounds evident on his bare feet. But after being rejected by two renowned cathedrals – St. Michael’s in Toronto and St. Patrick’s in New York — ‘Jesus the Homeless’ finally found a fan in the Vatican: Pope Francis. 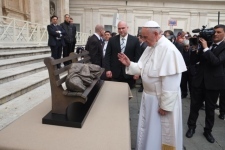 Sculptor Tim Schmalz travelled to Rome with ‘Jesus the Homeless’ last week to present the statue to the pope. Pope Francis examines the ‘Jesus the Homeless’ sculpture in Vatican City as creator Tim Schmalz looks on in the Vatican. Father Terry McGuire, a retired Catholic priest living in Waterloo, Ont., isn’t surprised the statue caught the pope’s attention. Schmalz, a graduate of the Ontario College of Art and Design, lives in St. Jacobs, near Waterloo. He specializes in large-scale bronze Christian-themed works, which have been commissioned for public monuments and Christian churches. He was inspired to create the 2.5-metre bronze statue after seeing a homeless person wrapped in a blanket in Toronto. The estimated $25,000 statue, which took about eight months to create, was funded by private donors. It eventually found its way to the Jesuit School of Theology at the University of Toronto’s Regis College. “Unlike a lot of sculptures of Jesus that have ever been represented that are meant to be put on a pedestal, this sculpture meant to be put just on a city street,” Schmalz said. Schmalz also sent a ‘Jesus the Homeless’ replica to Chicago, where it’s awaiting a permanent home. Another copy is on its way to Perth, Australia. And the sculptor has been working with the Vatican to find a place for the statue in Rome, where they hope to install it near St. Peter’s Square.